Apple's streaming service got a much-needed reboot. Here's everything we love and what we could do without. 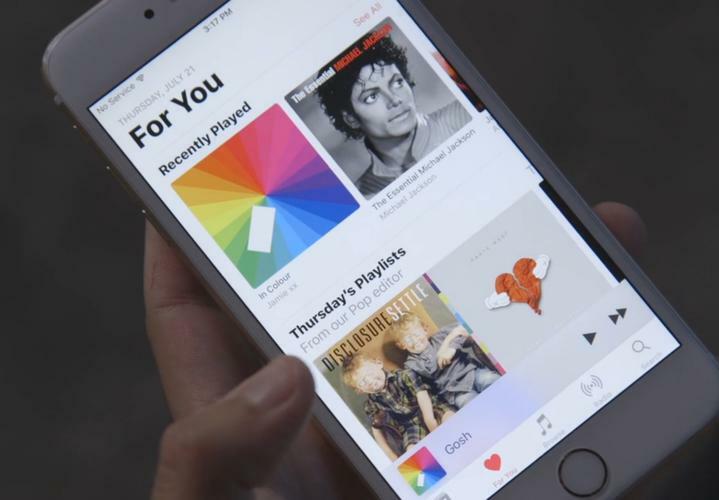 Apple Music was heavily criticized for just about everything when it launched last summer, and rightfully so—the app was needlessly complicated to use and handled your purchased songs and streaming library in an opaque, confusing way. So Apple redesigned the Music app in iOS 10, taking all of those critiques to heart. 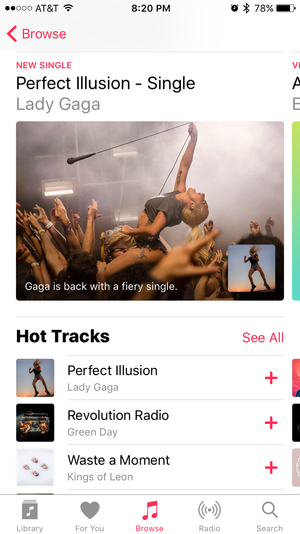 Apple Music cleaned up the clutter, reconsidered the navigation tools, put your library front and center, and added algorithmically created playlists to rival Spotify’s. It’s still not perfect, but the streaming service’s 17 million paying subscribers will have an easier time finding and saving the music they love. After installing iOS 10, the first thing you’ll notice when you open Apple Music is how much bigger everything is. The fonts are larger and so is the album art, with plenty of white space in between. Then you’ll see the new navigation bar, which is still pinned to the bottom of the app but now spotlights areas of the app that you actually need to see. Gone are Connect, the social network for musicians that no one uses; New, which was a catch-all for popular tracks and fresh playlists; and My Music, which had separated your streaming library from your playlists in a befuddling way. Apple replaced those tabs with Library, Browse, and Search, which combined make it much easier to find exactly what you’re looking for without all those extra taps. We may never know why Apple Music’s designers thought the best way to store your music was to divide it into your Library and Playlists, but those days are thankfully behind us. Now your library is front and center, with shortcuts to your playlists, artists, albums, songs, and downloaded music right at the top. Recently added songs and albums live underneath those shortcuts in a two-column view that emphasizes album art. It’s clean, simple, and gets the job done. I had one complaint about how Apple Music organizes your Library, but I found a fix that was completely unintuitive. Songs and albums are by default organized alphabetically by artist name, which made no sense to me. 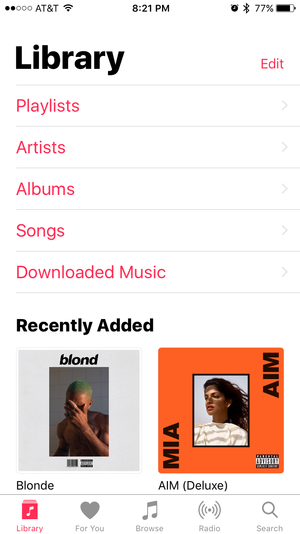 The fix: Go to your iOS Settings > Music, then tap on Sort Songs & Albums under Library. Switch By Artist to By Title. Thank me later. At first I loved For You, which in version 1.0 seemed to know exactly which human-curated playlists I would love. But those playlists got stale, and I stopped relying on Apple Music to help me discover fresh tunes. In iOS 10, Apple has introduced algorithmically selected playlists, My Favorites Mix and My New Music Mix, which are placed squarely at the top of For You. These are different from the Discovery Mix that Apple promised during the Worldwide Developers Conference in June, which sounded like a direct competitor to Spotify’s insanely popular Discover Weekly playlists. Spotify’s mix, which is refreshed every week, sounds like one your best friend would make you: deep cuts from your favorite bands combined with new music you’ll probably like and tunes from artists you’ve never even heard of. Discover Weekly understands your soul. I was hopeful that Apple’s Discovery Mix would be the exact same. But instead, Apple split up its algorithmic playlists into a collection of favorites, either songs I’ve favorited in the app or songs by artists I follow, and a mix of new songs the algorithm predicts I’ll like. The favorites mix is great, obviously, because I’ve listened to and loved those songs before. The new music was just OK. Neither were anything like Discover Weekly. For You also features recommended playlists which seemed to have no relevance to stuff I like—Wednesday’s Playlists featured a playlist of EDM samples and one called “Electronic BBQ.” No thanks. Then there’s a section called Heavy Rotation, which features songs and albums you play too much, Aritist Spotlight playlists, new releases, and every artist post that would’ve gone under Connect but now is buried at the bottom of For You. This still needs some work. Kill Connect already, Apple, and make those algorithmic playlists just as good as the ones made by humans. 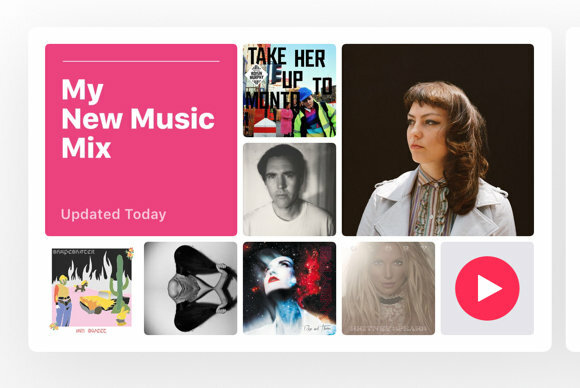 Browse is brand new to Apple Music, and it’s a tab that serves as a catch-all. From here you can navigate to New Music, where newly released songs and albums live alongside new artists, hot tracks, and “music you need to hear.” Here you can also get to the curated playlists made by Apple Music’s editors. You can browse playlists by activity, genre, or curator/sponsor (Shazam makes playlists, as do Pitchfork, Sonos, and Vogue). Then there are music videos, top charts, and genres, which seem like afterthoughts. It feels like Apple should’ve kept New as its own tab, since a big reason why people use streaming music services is to quickly find the latest releases and check them out before buying them outright. Apple is still clinging tight to Beats 1, as it should, and its 24-hour radio station is given top billing under Radio. Finding a Beats 1 show that already aired or listening to whatever show is currently streaming is easier than ever, which might turn Beats 1 into more of a go-to when I’m in the mood to let someone else play DJ. This tab is also where you can see the stations you’ve created based on a particular artist or song, or view Apple’s existing stations like Pop Workout, Classic Hip-Hop, or Francophone Indie, if you’re feeling fancy. Search is…search. Start typing in the bar at the top and you’ll see an option to search either Apple Music or just your library. You can view recent searches and trending searches. Does it need its own tab? I’m not sure. If Apple put a search bar at the top of Browse and gave new music its own section, I would be much happier. But overall, Apple Music’s redesign is a huge improvement over its previous incarnation, and a clear sign that Apple is listening to its customers. There are small tweaks that feel huge, like the ability to navigate to an artists’ pages from a song or album just by tapping on their name. Apple has largely done away with burying options in menus denoted by ellipses (so, so annoying). Now you long press on a song title to download, add to a playlist, create a station, or queue it up to listen to next. Then there are the addition of lyrics to the Now Playing card, which will help you slay at any karaoke party. These changes were so necessary. 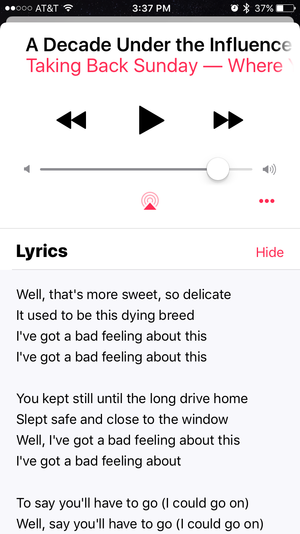 What do you think of Apple Music 2.0? Share your thoughts (or complaints) in the comments.